Awkafina made sure she was a standout when she hit the carpet yesterday(August 7th) in LA for the premiere of 'Crazy Rich Asians' at the TCL Chinese Theatre IMAX. 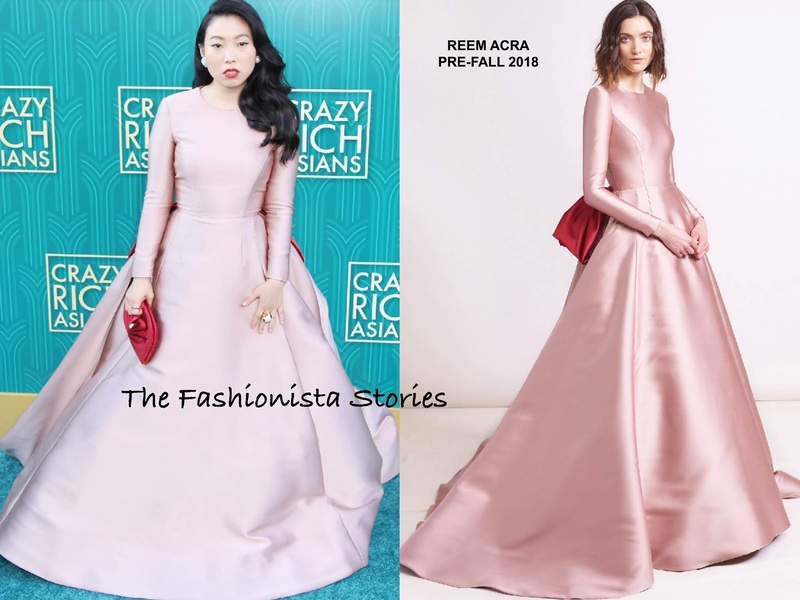 Making a dramatic entrance, she wore a pink long sleeve REEM ACRA PRE-FALL 2018 satin gown with a contrasting over-sized red bow in the back. The dress is basic in design but the volume of the skirt & the bow is where the impact comes in. However while the color looks divine on her, I find the bodice to be a bit too tight. Also I feel this is more suited for someone on the taller side. A colored lip, DAVID WEBB jewelry, a JIMMY CHOO clutch and GIUSEPPE ZANOTTI sandals finished up her look. Did Awkafina sell you on her look?